I am in the process of arranging for my latest collection of poems, “The Writer’s Pen and Other Poems” to be recorded and made available as an audio download. (“The Writer’s Pen” is currently available, as an e-book in the Kindle store and can be found here, https://www.amazon.com/dp/B07GD1LBMV/). I hope that my collection will be available, to purchase from audible.co.uk and audible.com by Christmas 2018. 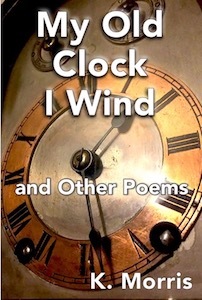 My previous collection, “My Old Clock I Wind and Other Poems” is available, as an audio download from audible.co.uk and audible.com, and can be found here, https://www.amazon.com/dp/B077VZTM3V/. Currently I am in the process of deciding whether to record “The Writer’s Pen” myself or whether to assign that task to a professional actor or actress. 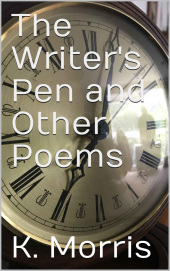 Once “The Writer’s Pen and Other Poems” is available in audio format I shall, of course post a link here. This entry was posted in books, creative writing, literature, newauthoronline, poems, poetry, uncategorised and tagged audible, audio downloads, k morris poet, kindle poems, My old clock I wind and other poems, newauthoronline, poems, poetry, The writer’s pen and other poems forthcoming audio edition on September 18, 2018 by K Morris Poet. This entry was posted in books, creative writing, literature, newauthoronline, poems, poetry, uncategorised and tagged amazon poetry, cyranny’s cove, k morris poet, kindle poems, newauthoronline, poetry, poets, the writer’s pen and other poems on August 29, 2018 by K Morris Poet.